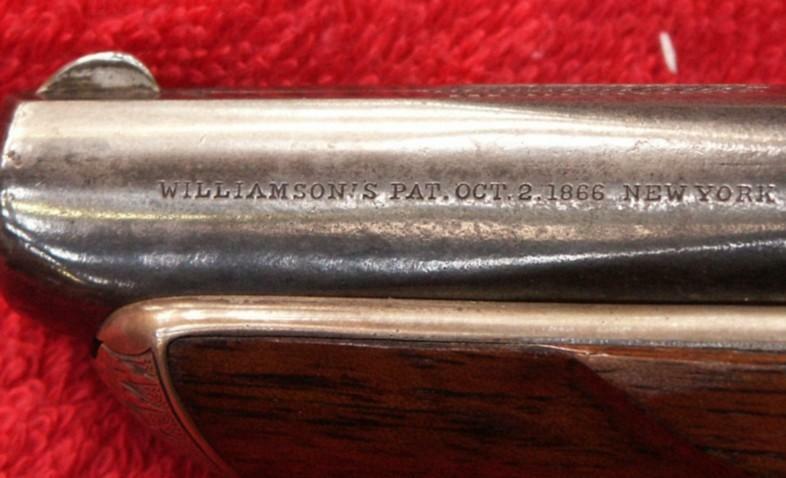 The Williamson is a single-shot pistol based on the famous Henri Deringer. It's a well-made weapon that offers a double percussion system for a very low production cost. Depressing the button under the forewood unlocks the barrel that can be slided forward as on the Sharps 4-barrelled derringer. The pistol can be loaded either with the same 41 extra short rimfire cartridges as used in the Remington Double Derringer. In that case, the blade shaped firing pin located in the head of the hammer will strike the cartridge and fire the round. Or, in the event cartridges are not available, the maker has added a reusable metallic shell, provided with a percussion chimney, that can be loaded with powder and ball and introduced in the barrel from behind. In that case, the central located chimney passes through a channel under the firing pin and will be striked by the lower part of the hammer.